Just like the postal service (neither snow nor rain nor heat nor gloom of night), we play through snow and sleet and fog and rain… well, actually we are playing in the midst of a dust storm. But as the super fine dust particles whirl through the air, lodging themselves in our hair, eyes, the corners of our pursed mouths, coating our bows and strings, the Playa Pops orchestra plays on. We are far from the concert halls some of the more seasoned musicians may be accustomed to and even farther away from the dust-free homes of those of us who only occasionally pull our instruments out to pick out a Bach sonata or a Beethoven symphony. The dust we usually wipe from our instruments comes from disuse — not desert. But now we raise our bows and dive into the Brandenberg Concerto #3 with vim and vigor, both in spite of the elements and perhaps even to spite them. “Is that the best you’ve got?” our bold fortes and clipped staccatos seem to ask, “bring it on!” The wind whips around our modest shelter, the Temple of Grace, an elegant structure made from wood laser cut to the point that it resembles lace — simultaneously strikingly beautiful and seemingly immeasurably fragile. 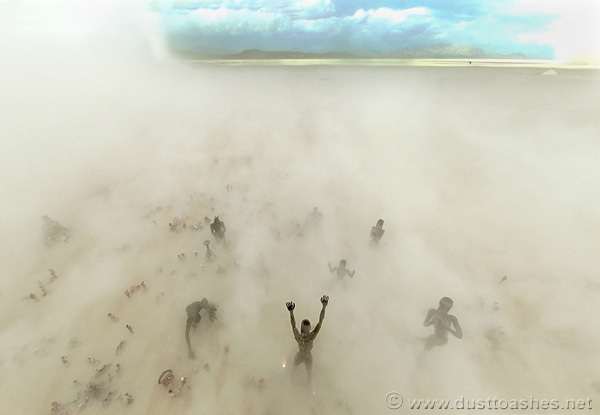 Many of the musicians are missing, lost in the dust storm, accurately called “whiteouts” for their sudden appearance and vision-destroying opacity. A cellist staggers in, midway through the performance, having gotten lost in the storm, only to have a string snap several songs later. But what is a performance like this without the adversity, the struggle? From the perspective of the random passerby, out of the dust floats the music of Beethoven. 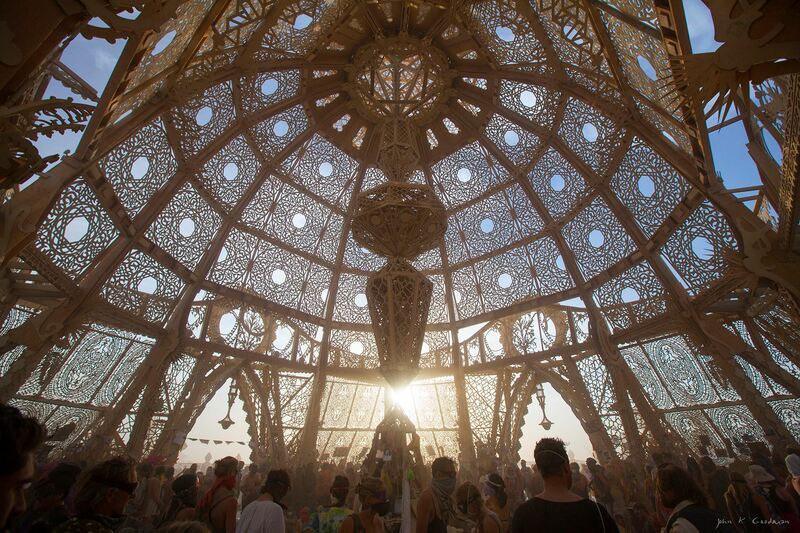 This does not seem possible, both because of its unlikely presence in the middle of a dust storm and its status as the first classical music presence at Burning Man, an event previously known for the thumping bass of electronic dance music. Drawn in by our music, passersby shelter (somewhat) from the storm. This statement does not completely capture the concept of immediacy, but getting caught in a dust storm does, in its most visceral form. When you can’t see the hand in front of your face, there is nothing beyond the now, the immediate. While not lethally dangerous, a dust storm causes almost all activity and future planning to grind to a halt, forcibly driving us into the moment. So many times in the default world, we longingly moon over other people’s travel photos, saying “gee, I’d love to go there someday.” An idle run-in with an old friend elicits a hopeful “we should hang out sometime.” Despite the best of intentions, neither these desires may come to pass. The audience huddles around us, either there by choice or by happenstance, breaking the circle only after the last bar is played — then swept away by the wind. As the wind finally begins to die down and the dust settles, audience members and musicians take the opportunity to clamber onto art cars or pedal away on bicycles, scattering back to their respective camps. 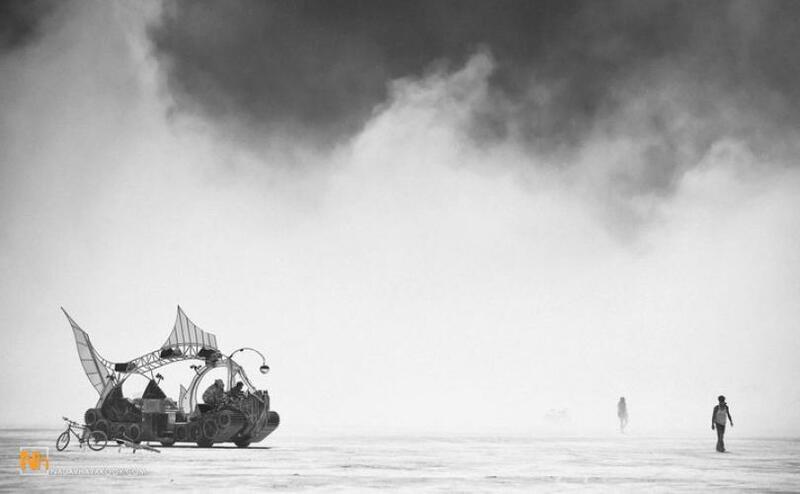 Even at Burning Man, an event almost wholly divorced from a conventional concept of time or schedules, people have found routines, places to be, things to do, and will soon be returning to them. But for a moment, everyone stood still, and just listened to the music. Each year after the burn, the mighty Playa Restoration Team spends a month or more on the playa, gridding out the abandoned skeleton of the city and doing an astonishing job of picking up and properly disposing of even the smallest bits of MOOP, like carpet fibers and cigarette butts (and they even seem to manage to make a good time out of it). Using GPS, they mark problem areas on a map; the camps that get marked yellow or red on the annual MOOP map may have serious problems getting placement from the corporation that runs Burning Man the next year. 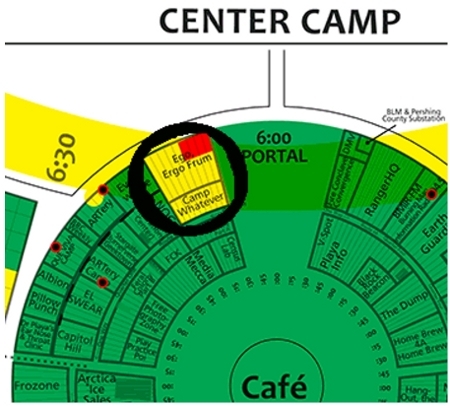 See the yellow and red marking “Ego, Ergo Frum Camp” and “Camp Whatever” as main MOOP offenders? It’s not the first year these camps have left behind significant amounts of litter and detritus — their MOOP footprint was similar in 2010, for instance — but the name of the main camp has been listed differently on the MOOP map each year. Why? Because “Ego, Ergo Frum Camp” and “Whatever Camp” are actually the public and private sides of First Camp, where the Board of Directors spend their burn. These are the people who adapted “leave no trace” from a Bureau of Land Management slogan to one of the Ten Principles that many burners consider sacred, holy writ. It’s kind of like the way the Board of Directors tells you not to commodify Burning Man. . . while they commodify Burning Man. These aren’t people who lack the resources to have someone else pick up after them, if they just can’t do it themselves; some of them have social secretaries camping with them, for god’s sake. . . but if First Camp was your camp, you wouldn’t be allowed back after leaving behind that kind of mess multiple times in recent years. Burner, these people aren’t like you. They don’t represent you, and they have no problem with double standards that treat you as lesser beings and hold you to a higher standard than them. They don’t deserve all the loyalty and support you give them. . . but if you have the will, they can be replaced. We need new leadership! Out with the corporatists! Burning Man for burners! 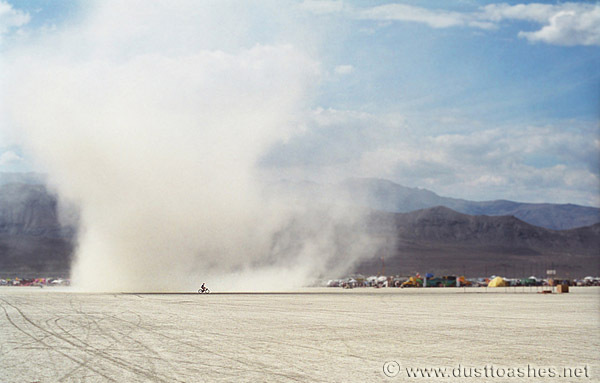 If you’ve been to a few Burning Mans you’ve probably encountered a few dust storms. Some say that it’s getting worse, either due to Climate Change, weather modification, or the environmental impact of TTITD. Whatever the cause, if things are getting worse then this recent killer storm should cause some concern to Burners – we could be in for a dusty summer. 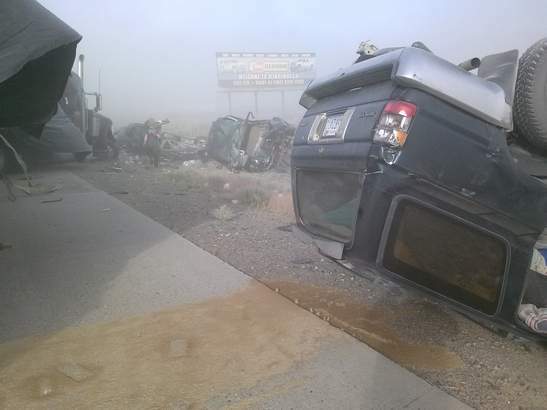 1 person was killed and 36 were injured, 2 seriously, after the severe dust storm caused a 27-car pile up near Winnemucca – home of the Bureau of Land Management Field Office that is responsible for Burning Man’s permit. Interstate-80, which runs from San Francisco to Reno then all the way across the country, was shut down for more than 19 hours. 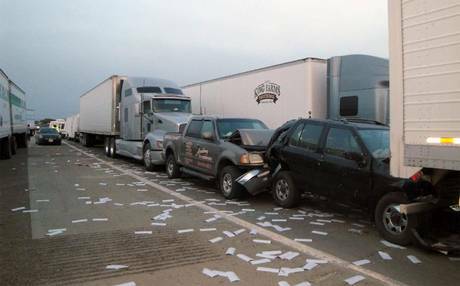 Blinded by dust as the storm tore across Interstate 80, vehicles began ploughing into each other at around 5pm on Monday, dramatically stretching limited emergency resources in sparsely populated Humboldt County. 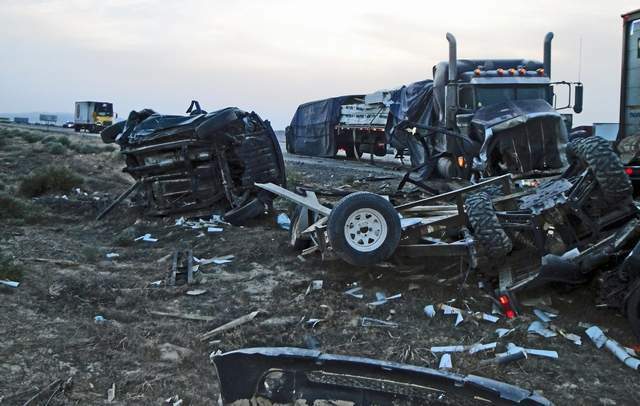 Officials at Humboldt General Hospital said drivers reported “near apocalyptic” conditions during the pile-up, which shut down a major trucking route in both directions for over 19 hours. Humboldt County sheriff’s dispatchers called in virtually every medical, law enforcement and fire worker in the area, with a mine rescue crew pitching in to help, and a charter bus company, Coach America, sending a vehicle to transport victims to hospital in an effort to lighten the load on limited ambulance services in nearby Winnemucca. Chicago resident Ravi Dyer was killed when his lorry rear-ended another commercial vehicle in zero-visibility conditions, according to Nevada’s Highway Patrol. Two other lorries then ploughed into the 51-year-old from behind, seriously injuring his passenger. 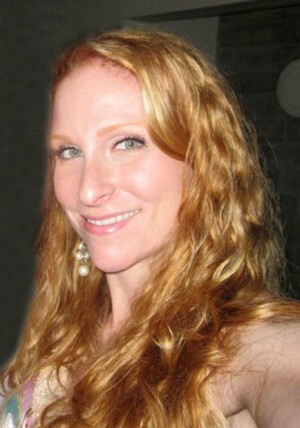 Humboldt General Hospital spokeswoman Nicole Maher said 26 people were treated at the hospital, including three in critical condition who were later transferred to a hospital in much-larger Reno, about 160 miles away. High winds whipped up dust — possibly loose from recently cleared fields — and created whiteout-like conditions, authorities said. 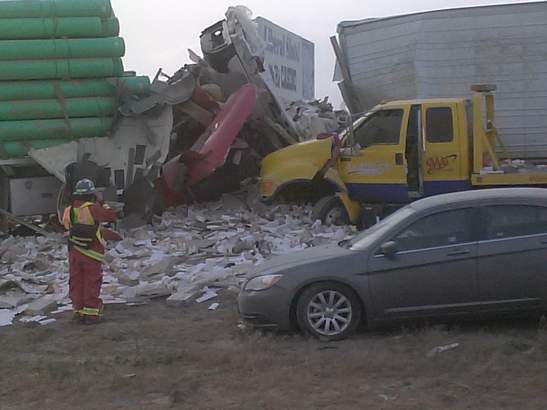 Vehicles, including semitrailers, passenger cars and a tow truck piled up in both directions.